The NHSTA has included four major car seat manufacturers on its latest recall list, citing faulty chest clips, among other issues. The holiday season is often a big time for traveling—and if you have small children, this year should also be a big time to exercise caution. It’s important to know that the National Highway Traffic Safety Administration (NHTSA) recently added more information to a current recall of thousands of child car and booster seats. Please note that these are not necessarily new recalls—rather, the NHTSA is providing further insight into existing recalls. The new notice impacts four different brands in particular, all of which were found to have faulty chest clips used in their products. Keep reading for more information on the issue, or visit the NHTSA’s website for additional details on who to contact or the next steps to take if you have an affected product. And keep in mind: it is the season of giving, so perhaps you could kick things off early by giving your child a safer ride. The company is known for its convertible car and booster seats, but both products have been impacted by the latest recall. Diono, formerly known as Sunshine Kids Juvenile, has recalled 519,052 of its car and booster seats. The affected products were manufactured between November 25, 2013 and September 5, 2017. The issue revolves around the particular chest clip used in the product, which, according to the company, could cause “an increased risk of a chest injury in the event of a crash”. A free remedy kit is available through Diono. Contact the company directly or check the NHTSA’s website for more information. The car seat company has recalled 148,165 of its Big Boost Deluxe booster seats, also because of issues surrounding the chest clip of the seats. Specifically, the faulty equipment could be responsible for causing “excessive force to be applied to the restrained child’s chest” in the event of a crash. While the company mailed out an alert to impacted users earlier this summer, no remedy has yet been developed, though Harmony Juvenile has said it will notify users as soon as one becomes available. Contact the company or the NHTSA for more information. 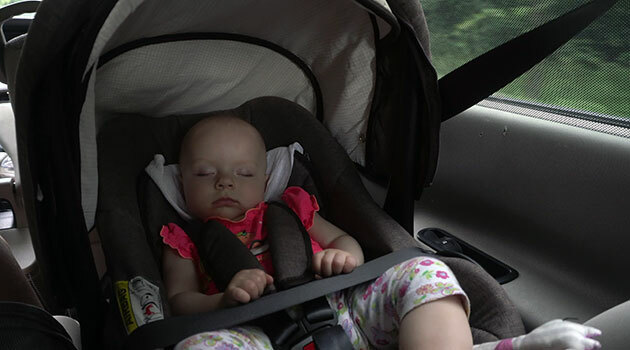 Some products offered by the car seat company Graco have been impacted by faulty webbing. Some models of the My Ride 65 convertible child car seat has been recalled because “in the event of a crash, the child seat webbing may not adequately restrain the child,” according to the NHTSA’s report. The issue may impact up to 25,494 products. A replacement harness will be issued to owners for free. For more information, contact Graco or check the full report offered by the NHTSA. The popular clip-in car seat company has also been impacted by the use of a faulty chest clip. Britax Child Safety announced in June of 2017 that some of its chest clips may break during impact and become a choking hazard for the occupant. This is not a new recall. Britax is also offering replacement clips, with more details available through the company’s website or through the NHTSA.